With so many successful touring singers having to cancel shows and taking time off due to vocal issues, it’s timely to shout out about how to sound better without hurting your cords, or your career. Look, most producers and industry tastemakers don’t care if you are shredding your cords, they don’t expect you to last, let alone make it big. Plus the fact that as a contemporary commercial singer (Pop, Rock, R&B etc. ), what sounds good is not usually healthy (more about that below). Shockingly over the years, I’ve discovered that most labels have a kind of blasé attitude towards singers training (and prefer not to have the expense). I consider that a big problem for you, the vocalist. So consider it up to you to protect yourself. Don’t burst your cords with a hemorrhage, it’s completely avoidable when you know how to prevent it from happening in the first place. When you sing your vocal cords pull together to make sound. When you sing a louder note, sometimes they can over-close and strike. A glottal happens when the vocal cords strike together. The more they strike the sooner an edema (swelling) occurs followed by a blister, which then hardens and becomes a nodule or polyp. Glottals happen when you try to sing loud or aggressively to “pop” the note (and always on a vowel). Say “I” loudly. You probably struck your cords together. Did you feel it? Do it again. See if you can feel it? When you sing well, you can sing with volume and power without striking the cords. To strengthen your vocal cord closure without striking your cords, practice singing a vowel with a baby “h” on it until you can dissolve the “hi” without striking your cords. 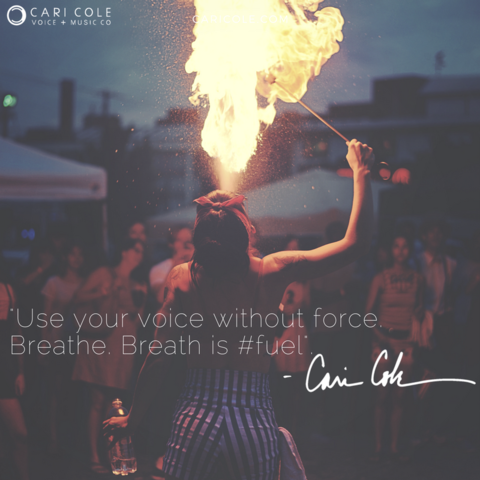 If you are having vocal problems, then set up a Cole Power Hour with us and we’ll identify the issues and get you set on the right track. Most singers that strain are not using the breath enough. Singing is a balance of “air” and “muscle” and when you overuse “muscle” you underuse the air. The breath and airflow used correctly (with cords that are strong enough to close without touching – training does this for you) will relieve strain and you’ll sing louder and more freely. Try taking a deeper breath into your ribs (breathe sideways into your ribs not up) and back ribs. Try pushing the breath into your back and feeling your back ribs stretch open slightly upon inhale. This will help support high notes. 3. Keep Your Chin Down. Well trained singers make it look so easy. One of the tricks is to keep your chin down and not reaching it up for higher or louder notes. Practice singing through your range and your songs and don’t let your chin lift up at all (like you are a ventriloquist). It will force you to start using the right muscles instead of contracting the back of your neck and tightening your jaw to sing (which only burns out your voice and limits your range anyway!). 4. Gently Pull Your Larynx Downward. This is one of my biggest tricks and not even vocal coaches (unless they’ve trained with me) know this one. It’s so effective that it is one of the exercises in my popular Singers Gift Vocal Warmups Series that is transforming singers worldwide, sometimes in just one application. Place your thumb and forefinger at the top of your adam’s apple or thyroid cartilage. Now gently yawn in the back of your throat and gently pull your larynx (vocal muscles) downward. Repeat 4 or 5 times. Do it gently, don’t force anything. If it’s not moving easily that means you have super tight vocal muscles which could be causing you to strain when you sing. When the larynx moves more easily downward (like when you yawn) your voice is freer of tension. This step alone can restore a hoarse voice that is hoarse due to tension. You will find complete instructions in the Singers Gift Vocal Warmups Series which trains your voice to warm up, not wear out. 5. Lift Your Soft Palate. When your Soft Palate is lifted you literally make room for higher notes and your voice will have better pitch (fixes flatness). Follow the roof of your mouth with your tongue from front to back. Notice where it turns “soft.” This is the soft palate. In a good singer (or well-trained singer), the soft palate is lifted during singing to create more ease, better pitch, less nasality and freer singing. To practice, begin a yawn. Do you feel your soft palate popping up at the onset of the yawn? Get familiar with that feeling right before singing as you inhale. For a more advanced exercise check out these exercises here where I show you how to exercise the soft palate and get more control over it! 6. Pull Your Cords Together Without Touching. So one of the benefits of training your voice with a good vocal coach is to learn how to pull your cords together (as mentioned above in # 1) without touching which in time develops tone and ultimate breath control. One of the exercises we use to do that is Gee-ee-hee-ee-hee’s. Sung in a descending scale the ee’s pull the cords together and the h’s ensure there is a little puff of air between the cords to keep them from touching and help them manage the air flow correctly. I use Gee-hee’s in Warmups and in Cool Downs (post-performance conditioning) in my series of vocal warmups. They rock singers voices and keep them healthy! You’ve heard it before, but maybe you haven’t experienced the difference, because once you do, you’ll never again sing dehydrated, that’s how big a difference it makes. A dehydrated voice gets hoarse super fast, can’t hit high notes and is super bumpy around the break. Your voice can even cut out on certain notes (nightmare.) A well-hydrated voice will feel easy, you’ll be able to sing high notes with no problem and your voice will feel super smooth. See my blog from last week for how to stay extra hydrated. Check. Be sure you are using the right warm-ups pre-performance, and the right cool down’s to condition your voice post-performance. Just singing your favorite song is by no means a warm-up for your voice long term. A professional Warm Up will open and stretch your vocal instrument and you’ll get much more endurance and way less fatigue as a result. Click here for the best Warm Ups that help you warm up and not wear out! If you’re looking for another option to join a community of driven, like-minded artists in a program that will transform your voice, mindset, and performance then Vocal Freedom Circle. Our next run starts June 25th so don’t hesitate to check it out and find your vocal freedom.